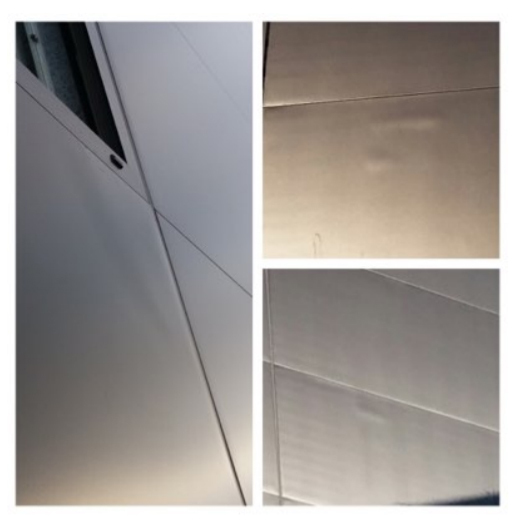 During the manufacturing process depending on the make of panels 'blisters' can form on the panel surface, the most typical cause of this is due to insufficient glue to the area in question, in other panels (due to chemical reactions) these 'blisters' can form due to gases that are formed. 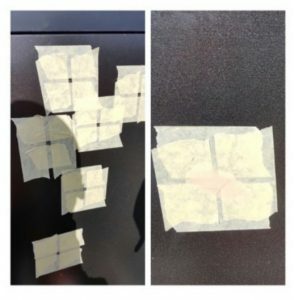 There are many different ways to address this issue, some include pinning or cutting the area back then using a combination of fibre glass and body filler to fill the area and sand it back flush, however this type of repair should be last resort due to the complexity and the general cost association. The glueing process should always be the primary remedial process for this type of defect. We always recommend using a long thin drill piece obviously length will depend on panel type. 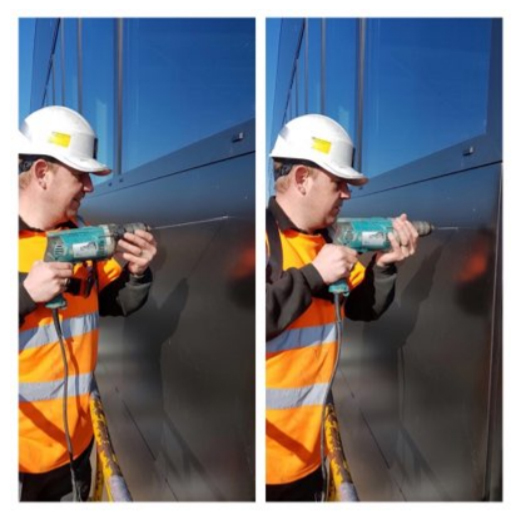 Our operatives drill various holes, 1 for every 10 cm2. At least one must (if practically possible) be drilled straight through the panel to allow any gases to be realised and dissipate. We would then utilise rods with hooks to activate the surfaces internally and provide an added 'key' to help with adhesion. Once the holes have been drilled our operatives will use a specially formulated two part glue, this will be injected into and around the de-laminated areas via the holes created, the glue is fast drying and the operatives will hold back and push on the alloy for 4-5 minutes until the glue is dry enough to hold the alloy back to the insulation. Sometimes depending on conditions it may be practical to use a heat gun to speed up the process. 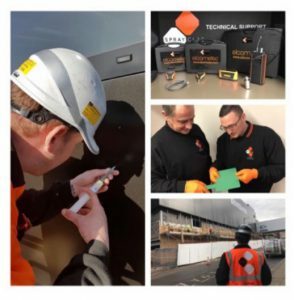 We would also recommend that if possible this process be done before the panels are installed, the process can be easier when the panels are laid flat and then weights can be applied to help with a better adhesion process. 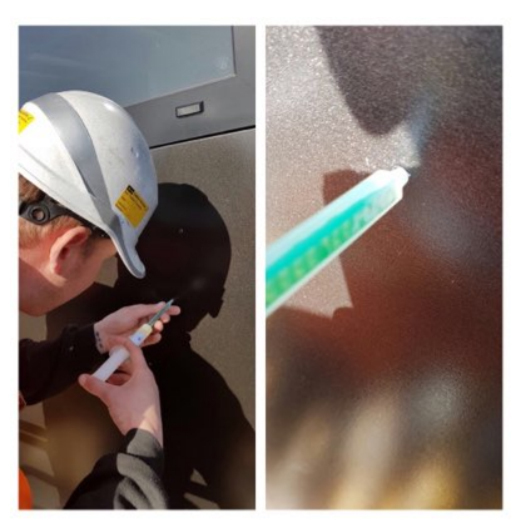 Once the glue has dried, operatives will remove any external glue (if present) and then fill the small holes using a two part body filler, once cured these will be rubbed back flush and then depending on panel colour will be touched in using a brush to the small areas or complete panel surface resprayed using a HVLP spray painting kit. This repair process has been tested and used for a few years now and has in general a good success rate, now that we have mastered the actual technique and acquired a dedicated product we are more open to offering this service to our clients. However you must be aware that even though this treatment has been developed along with both panel manufacturers and installers, we are yet to offer any guarantees and we do not yet have any long term testing results or evidence of durability, even though theoretically this repair should last the lifespan of the panel in line with the guarantees set by manufacturers (25 years).